It was the first time Trump said directly that he would cooperate with Russia collusion prosecutor Robert Mueller. 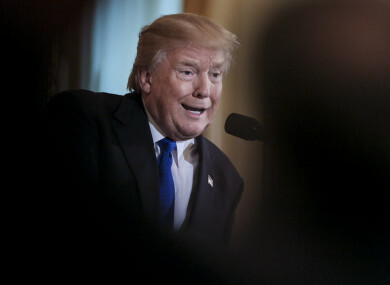 US PRESIDENT DONALD Trump said yesterday that he “would love to” be questioned under oath by Russia collusion prosecutor Robert Mueller, adding it could happen in the coming weeks. Trump confirmed that his lawyers were in discussion with Mueller, who is leading the investigation into allegations of collusion between the US president’s campaign and Russia in the 2016 election, and also into accusations that Trump tried to obstruct his probe. “I would love to do it,” Trump told reporters in the White House when asked about testifying. “I would do it under oath, absolutely,” he added. Asked when an interview could happen, Trump replied that he didn’t know exactly. “Yesterday, they were talking about two or three weeks,” he said. It was the first time Trump said directly that he would cooperate with Mueller, whose investigation he has repeatedly dismissed as being based on “fake news”. “There has been no collusion whatsoever. There is no obstruction whatsoever,” he said yesterday. But any interview of a US president in an investigation is fraught with issues of executive privilege – how much and in what context the US leader can be forced to disclose information. In Trump’s case, it also raises deep concerns that his shoot-from-the-hip outspokenness could jeopardize his own legal position. White House lawyer Ty Cobb later seemed to walk back Trump’s remarks, saying the president just meant that he was willing to meet, The New York Times reported. “He’s ready to meet with them, but he’ll be guided by the advice of his personal counsel,” the newspaper quoted Cobb as saying. Cobb has repeatedly said that the president is willing to testify to Mueller’s investigation, and wants Mueller to wind up the case as early as possible. Mueller is believed to be focusing on whether Trump illegally interfered with the Russia investigation, particularly when he fired FBI director James Comey last year. Mueller, himself a former FBI director, is also examining the extent of communications between Russians and Trump campaign officials. Those include a meeting in June 2016 between Trump’s son Donald Trump Jr, his son-in-law Jared Kushner, and a Russian lawyer who had allegedly offered them dirt on Trump’s election rival, Democrat Hillary Clinton. He has already issued indictments for four people from the campaign, securing guilty pleas from two: former national security advisor Michael Flynn, and former foreign policy advisor George Papadopoulos, both for making false statements. Mueller’s investigators have been edging steadily closer to the White House, last week interviewing Attorney General Jeff Sessions – who was a top Trump campaign official and had three meetings in 2016 with Russia’s US ambassador, Sergei Kislyak. He has interviewed Comey and other former officials, and is reportedly going to interview former White House strategist Steve Bannon in the coming days. The form of a Mueller interview with the president still needs to be negotiated – whether it is face-to-face, or in writing, or a mix. We are going to find out… I hope so. But the case might not be cleared easily. Trump’s repeated tweets attacking Comey and the FBI have added to suspicions that he has sought to stymie the Mueller investigation. On Tuesday, the Washington Post reported that Trump had pressed Comey’s temporary replacement, FBI deputy director and Comey loyalist Andrew McCabe, to tell him who he voted for in the 2016 election. Since then, Trump has pressured the current FBI chief, Christopher Wray, to fire McCabe. White House spokeswoman Sarah Sanders dismissed The Post’s report on the Trump-McCabe exchange by saying she doubts “any person in America” cares about it. That sparked a mass rebuttal on Twitter by Trump critics declaring they do care, using the hashtag #onewhodoes. The US president is travelling to Davos this today to the World Economic Forum. Email “'I would love to do it': Trump says he's ready to be questioned in Russia investigation”. Feedback on “'I would love to do it': Trump says he's ready to be questioned in Russia investigation”.